Give your hardworking Keurig a pick-me-up—and improve the taste of your favorite decadent drinks—with this quick and easy descaling routine. Whether your daily drink of choice is a frothy latte, creamy hot cocoa, or an old-fashioned cup of Joe, the Keurig can satisfy your caffeine cravings in record time, all without leaving pesky spills behind. But after serving up buzzworthy beverages around the clock, even a no-fuss, no-mess coffee dispenser like the Keurig requires a routine cleanup to keep up with your coffee habit and keep out the most unsavory of intruders: limescale. Limescale can take up residence on the inside of any heated appliance when hot water evaporates and leaves behind solid white calcium deposits. If left untreated, the chalky culprit can diminish the look of your coffee maker and produce a bitter aftertaste in your morning Joe—even prevent your Keurig from heating up. Fortunately, even stubborn limestone breaks down when exposed to the acetic compounds found in store-bought descaling solution or the household equivalent, vinegar. 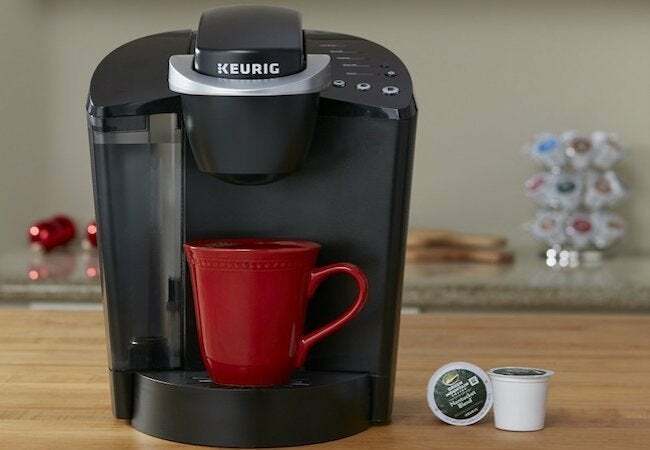 Use your preferred solution when you follow these instructions for how to descale a Keurig, and follow through with the routine every three to six months (some of the company’s newest coffeemakers even remind you to do so with an alert!). You’ll not only improve the taste of brewed beverages, but also extend the life of your Keurig. If your Keurig model has the auto-off capability enabled, disable it according to the owner’s manual. Then, power off and unplug the brewer before descaling. When the brewer is cool to the touch, remove any detachable parts, including the Keurig water reservoir, lid, water filter, drip tray, and brewing pod holder. Empty residual water from the water reservoir into the sink, and discard any used brewing pods and their grounds in the trash. Then, wipe down the interior and exterior of the water reservoir and other loose parts with a damp, non-abrasive cloth. Dry and reinstall all detached parts except for the water filter. Never submerge the electrical components of the brewer underwater. 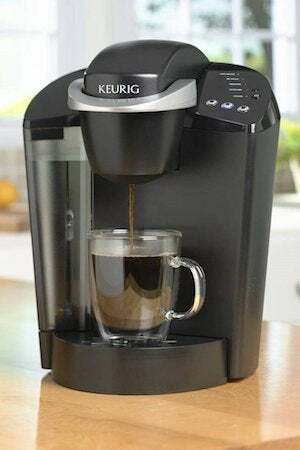 • If using Keurig descaling solution, pour equal parts descaling solution and water into the water reservoir to fill it. Depending on the model and size of your brewer, this could range anywhere from one-third of the bottle to a full bottle of Keurig’s 14-ounce descaling solution, followed by an equal amount of water. • If you prefer a DIY descaling solution, pour equal parts water and distilled vinegar into the reservoir until full. Plug in and power on the brewer. Then, place a large mug on the machine’s drip tray. Without inserting a Keurig beverage pod, lift and lower the brewer handle. (If on a smaller Keurig appliance the water reservoir is not detachable, allow five to 10 seconds here for any descaling solution to drain into the appliance before lowering.) Select the largest brew size and then press the Brew button to start a cleaning brew cycle using the reservoir filled with descaling agent. When the cleaning cycle is complete, remove the mug and discard the hot water in the sink. Repeat this step until the appliance prompts you to refill the water reservoir, or there is no more visible scale in the water reservoir. Then, power off the brewer and wait for 30 minutes before removing and discarding the contents of both the mug and the water reservoir. Reinstall the water reservoir in the brewer. Without exceeding the maximum fill line, fill the reservoir with fresh, filtered water from a clean pitcher or glass. Power on the brewer and return the mug to the drip tray. As in Step 3, start another cleaning brew using the largest brew size to rinse away any residual build-up or vinegar odor from inside the Keurig. Repeat the fresh water rinse cycle at least three and as many as 12 additional times for heavily scaled brewers, refilling the depleted water reservoir with fresh water as needed to complete the brew. More is better: You will not want any lingering vinegar or descaling solution to taint a future cup of coffee. When you’re finished rinsing the brewer, power it off and discard the residual water from the water reservoir. Rinse the reservoir with filtered water, then air-dry it before reinstalling it in the brewer. Regular cleaning of your Keurig will allow you to enjoy your favorite hot drinks the way they were meant to taste.